The Beijing Olympic Games have come and gone. And with them, aided by technology including a uniformly deeper pool, improved wash-off areas, and high-tech swimsuits, so have 70 world swimming records this year. In fact, swimming now suffers from such a dramatic credibility crisis that a race in which a world record is NOT broken is a disappointment. I dare suggest that you will be able to recall such a race in Beijing (though you may have to try hard, because there were not many). If an Olympic Gold was one without a world record being broken, it was met with rather disappointed silence. Olympic fever – how bad was it? The table below demonstrates just how easily records were broken in Beijing. Out of a total of 32 events (16 men’s and 16 women’s), an incredible 21 events had world records broken a total of 25 times, and 66 Olympic records were set. Only ONE SINGLE Olympic record managed to survive for men and women. It was a complete clearing out of the Olympic (and World) record books. That is, in my opinion, a problem for the sport of swimming – 70 world records in one year, and 66 Olympic records in one Games is not a symptom of a credible sport. I’m sure that some will disagree, but bear in mind that these 70 records are only the times of the WINNERS. There were races in Beijing where the first 5 finishers were swimming faster than the old world record! The South Africa 4 x 100m relay team, for example, swam almost a second faster than they swam only four years earlier to win gold in Athens, and they finished seventh! The 100m freestyle record first went under 48-seconds in 2000. And then for eight years, 48-seconds was the magical “barrier” which only one man could break (Peter van den Hoogenband). Since the start of 2008, ELEVEN men have swum faster than 48-seconds. The result is that legends of the sport, whose position in all-time lists was secure, are suddenly line items in the swimming record books, forgotten and displaced almost overnight thanks not to improved swimmers, but improved technology. That this should happen is not the problem – Paavo Nurmi and Jim Peters, two great long-distance runners from the past, can hardly expect to remain in the record books given the advances in technology over the last 50 years in their sport. The problem is the pace with which it has happened. Within one year, records have been forgotten, and the swimming world record is now an endangered species. And that is not good for the sport. To look at this a little more objectively, I looked at the AVERAGE AGE (in days) of world records in the swimming events. The tables below show the age of men’s and women’s world records on the day that the Olympic Swimming events began. The arrows on the left hand side show which events had their records broken in Beijing (these records are then “aged” zero days old for this analysis), while the red arrows on the right show the records that had stood for longer than 2 years going into the Beijing Olympics. 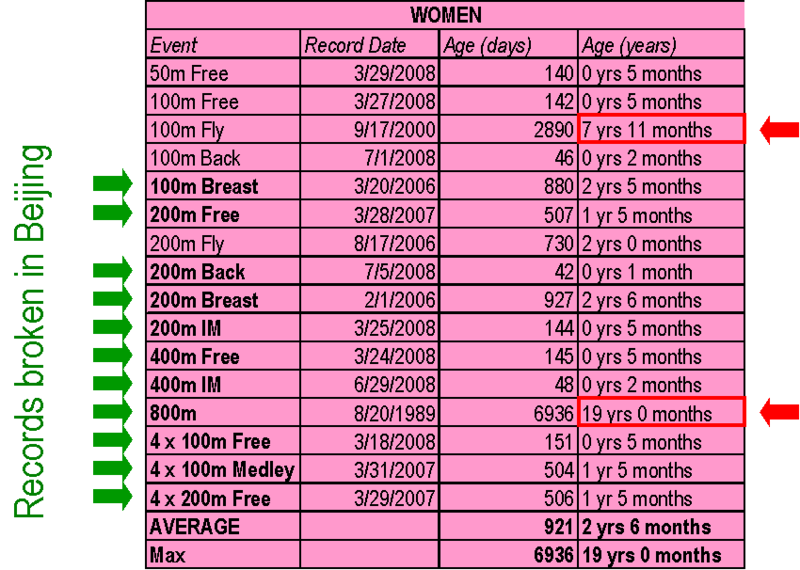 For the men’s analysis, the average age of the swimming world records BEFORE the Beijing Games was 680 days. As a result of the carnage in Beijing’s Water Cube, it fell to 382 days (because 11 events had their records reset to zero days). There are now only THREE records older than 2 years – the 100m Butterfly (Ian Crocker), the 400m Freestyle (Ian Thorpe) and the 1500m Freestyle (Grant Hackett). On the women’s side, it’s even worse. The average age BEFORE Beijing was 921 days, though that was massively skewed by one record – that of Janet Evans in the 800m freestyle. That record was broken in Beijing (by Rebecca Adlington), and the result is that a female swimming record now has an average age of only 247 days. In other words, women’s swimming records have on average been set in the last year. Only one record is older than 2 years – the 8 year old record of Inge de Bruijn in the women’s 100m butterfly. You may still believe this is not a problem, and that is, I guess, personal choice. The essence of the sport is the competition – the race – and so the times are the fineprint, you may argue. Does it matter that a gold is won in a time that does not rewrite the record books? Perhaps not. But as someone who comes from a track and field background, where world records are special and meaningful, swimming really does face a crisis of credibility. It can certainly not boast about a meeting in which 66 records are set – that’s not progress. Rather, it makes a mockery of the past, or the present (depending on your point of view). So the obvious question is who do we put this down to? And the answer, as we have actually been saying this whole year (this is a topic we covered extensively in the build-up to Beijing), is FINA, swimming’s governing body. The founder of the company that makes the Rocketsuit is quoted as saying “The Rocket Skin has already been used in triathlons for non-wetsuit legal races and we have seen performance advantages of up to 6 seconds per 100 meters and 1500 meter races done in 87 degree water with no issues of overheating”. I feel safe in suggesting that this is probably marketing hype speaking, and we won’t see a 42 second 100m freestyle in this suit! But the point is, the technology exists, and FINA failed miserably to impose its admittedly weak laws on suit design back in April when they met about the suit. Now they must face the consequences. The trouble is, they don’t seem to care. P.S. 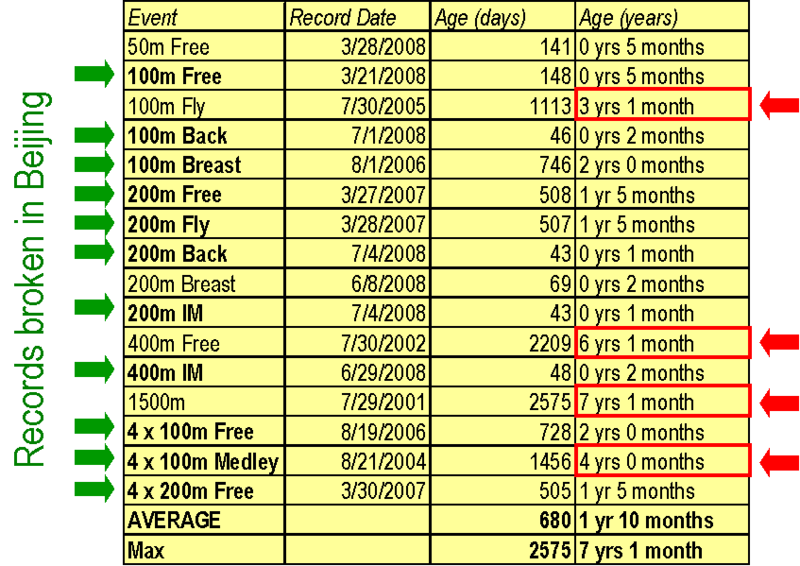 Looking at those lifespans of the swimming world records raises some interesting thoughts, and perhaps you’ve already begun wondering how swimming compares to track and field? Never fear, I’ve done that analysis too, and I’ll post on that next! And it throws up a few very interesting implications! So join us then!